Your age is often determined by the shape of your face. If you are concerned about deep lines, fine wrinkles and sagging skin on your face, *a liquid facelift with minimal downtime may be the solution for you. As a renowned surgeon in New York City, request a consultation with Dr. Levine to achieve a desired transformation, from a liquid lift to an eyelid lift in NYC. A liquid facelift is a true New York minute procedure. *It can be completed during a patient’s lunch hour, as it takes approximately 45 minutes, depending on the individual needs of the patient. The results of a liquid facelift depend on several factors, including the type of fillers used, the lifestyle of the patient and the skill of the physician performing the procedure. *One of the longest lasting fillers used is Voluma, which can last up to 2 years at full correction. More superficial fillers such as Restylane last approximately 6-9 months*. The skill of the physician is an important factor because the proper placement of the injections and the use of appropriate products for the individual patient can help make the results last and look more natural. Depending on your lifestyle and other factors, touch-up treatments may be needed every 6-9 months*. While liquid facelifts do not require downtime, swelling can last approximately 48-hours*. This is due to fillers being hydrophilic, which means they bring water to the area of the injection site, causing swelling. Cold compresses will be applied most treatment to minimize swelling. 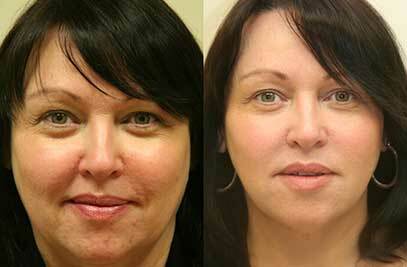 *Dr. Levine performs Liquid Facelifts from the comfort of her office in NYC. 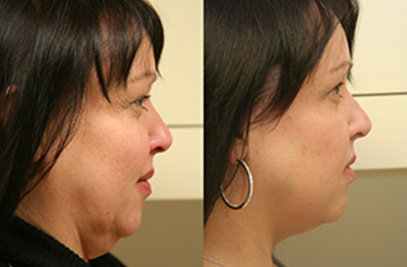 The liquid facelift consists of fillers, as described in the above procedure. However, as a medical sculptor, Dr. Levine’s goal is to achieve a patient’s desired transformation that brings out the optimal beauty of their face. *In order to do so, Dr. Levine may suggest a combination of procedures, all of which can typically be completed within an hour and a half in her NYC office and require minimal downtime. The combination of natural, non-surgical facelift procedures such as Ultherapy with the liquid facelift allows for a deeper, longer lasting effect that brings out the patient’s beauty rather than looking artificial. After, Dr. Levine addresses smile creases and wrinkles towards the front of the face. By starting an injection laterally, Dr. Levine minimizes the amount of product and injections that will be needed on the bottom or center of the face, giving a more oval or heart-shaped look. Once the fine wrinkles around the bottom of the mouth are injected with filler, Dr. Levine may use products such as Dysport™ on the brow area and on the white part of the lip to release fine lines, improving the natural, rejuvenated look of the face. Products such as Botox, Dysport and Xeomin simply relax the nerves in the immediate area, which cause muscle action that is responsible for the lines. It is also inserted into the skin of the neck, if necessary, which allows for the smoothing of the skin. Dr. Levine recognizes that every face is unique, so the combination of fillers used during a liquid facelift procedure highly depends on the individual person. 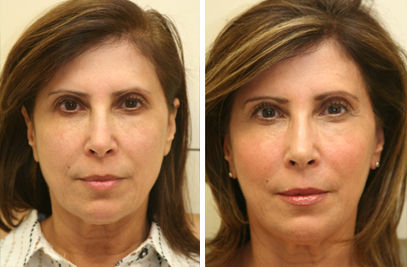 To give you an idea of the combination, *Dr. Levine may use Voluma face filler for the lateral parts of the face, which has a duration of about 2 years due to its VYCROSS™ technology. For nasolabial folds towards the front of the face, Restylane filler can be used, which lasts approximately 6-9 months*. Belotero or Restylane Silk could then be injected into the fine wrinkles around the bottom of the mouth. Keep in mind that how long the effects of the filler last depends on the composition of the filler as well as how fully you were “corrected,” or if you were given the full amount of filler and where the physician has injected the filler. *While some results are immediate, it may take up to 2 weeks for the patient to see the full effects*. Swelling can last approximately 48-hours*. *If a patient chooses to do Ultherapy, otherwise known as a non-surgical facelift, with a liquid lift, full results may take approximately 3 months to appear, as Ultherapy works naturally to stimulate collagen production. To find out the best option for you, schedule a consultation with Dr. Levine today. For a more result, patients may opt for a surgical approach by having a face lift in NYC. NYC surgeon, Dr. Levine will go over all of your options during your initial consultation.